The 18-year-old victim has now been identified as Reese Fallon, Toronto police said Monday evening. 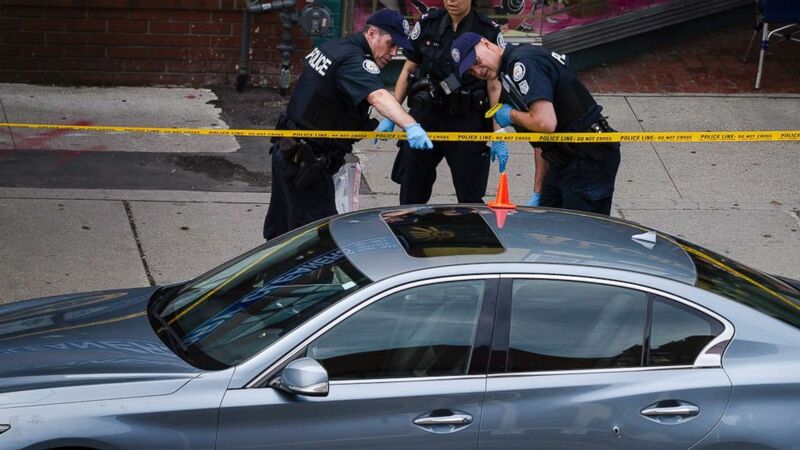 "It's way too early to rule out anything," Toronto Police Chief Mark Saunders said. The 13 injured, ranging in ages from 10 to 59, suffered minor to "life-changing" injuries, officials said Monday afternoon. The shooting unfolded quickly at about 10 p.m. near Danforth Street and Logan Avenue, which is in the city's Greektown neighborhood, often referred to as The Danforth. There was an exchange of gunfire between police and the suspect, who was armed with a handgun, authorities said. The suspect fled on foot and was found dead nearby. A weapon has been recovered in the wake of what police called a "disturbing incident." The family of the man identified as the gunman released a statement saying Hussain suffered from mental health problems. "We are at a terrible loss for words but we must speak out to express our deepest condolences to the families who are now suffering on account of our son's horrific actions. We are utterly devastated by the incomprehensible news that our son was responsible for the senseless violence and loss of life that took place on the Danforth. Our son had severe mental health challenges, struggling with psychosis and depression his entire life. The interventions of professionals was unsuccessful. Medications and therapy were unable to treat him. While we did our best to seek help for him throughout his life of struggle and pain, we could never imagine that this would be his devastating and destructive end. Our hearts are in pieces for the victims and for our city as we all come to grips with this terrible tragedy. We will mourn those who were lost for the rest of our lives," the statement read. The shooting has left Toronto in mourning. "My thoughts are with everyone affected by the terrible tragedy on the Danforth last night in Toronto, and may the injured make a full recovery," Canadian Prime Minister Justin Trudeau tweeted Monday morning. "The people of Toronto are strong, resilient and brave - and we'll be there to support you through this difficult time." Choking back tears, Toronto Councillor Mary Fragedakis said to the city council Monday morning, "This is so heartbreaking. The victims and their loved ones are in my thoughts and prayers. I cannot imagine what they are going through, the pain, the loss." The area has always part of her home and her life, she said. "As we mourn, cherishing and caring for those in our lives may help with the pain," she said, overcome with emotion. Toronto Mayor John Tory, speaking at the overnight news conference, acknowledged the Canadian city's problems with gun violence. "We still live in a great city," he said, "but we have to be ever more vigilant about this kind of things."